The mornings have all been fairly different here since we arrived early last Saturday .. sunny skies and warm, partly sunny and cool, cloudy and overcast .. But the one thing that remains constant it seems here in South Dakota .. I had never thought much about how windy it is until this week, where for starters .. we have had a lot more time to hang out. Usually we are passing through on our way further west. Or here for all of about 36 hours, turning around and heading back home. But each morning, when I look out the window, all I can tell for certain, is that it is windy. And .. that .. if I leave my clothes on the line .. they may not be there when we I go to check on them again. It is relatively flat, this side of the state. So there’s not much to stop the wind from gaining momentum and swirling around every corner, every tree, every building. Watching the grass on days like today is mesmerizing. The wind almost appears to make everything dance. So, it’s beautiful on some respects. Windy enough that I had no idea how sunburned I was getting the other day because everything still felt cool. Until I came in out of the sun ..
And, the Cowboy’s ranch is located in only a Fair to Moderate part of the state where wind is concerned, according to http://www.windpoweringamerica.gov/maps_template.asp?stateab=sd. I can’t imagine if we were in the Excellent, Outstanding or Superb areas of the state. “Every day in South Dakota is nice .. as long as the wind isn’t blowing,” says the Cowboy. That has me wondering how many nice days there are here .. but he assures me, most are .. even with the wind howling over the plains. It also has me thinking .. if the wind one of South Dakota’s biggest crops, is it being harvested to its fullest potential? Apparently there are significantly more wind farms in South Dakota today than there were at the time this piece was done. The Cowboy says one of the biggest wind farms in the state is actually not far north of the ranch. All I know at the moment .. is that I need to keep my hat cinched tighter when we’re out riding. That the resistence training on my runs is au natural. And while it has quickly helped to dry many a load of laundry, saving us from running the dryer .. we need to run the wash again. Because that white clump out in the middle of the neighbors field indeed is one of my favorite shirts that blew away. 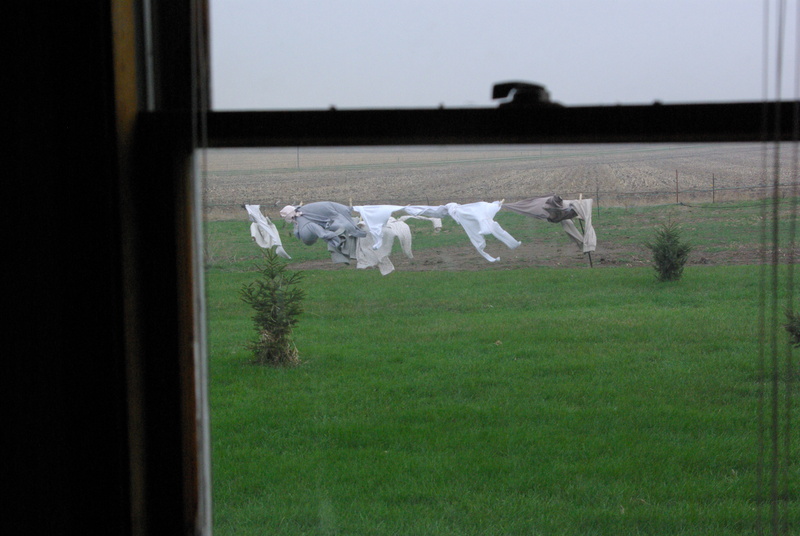 This entry was posted in Cowboy, Energy, Life, Lifestyle, NPR, South Dakota, Travel, Uncategorized, Weather, Wind, Wisconsin and tagged Cowboy, Family, Hanging Laundry to dry, Harvesting WInd, LIfestyle, Minnesota Public Radio, South Dakota, Wind, Wind Energy by Carleen Wild. Bookmark the permalink.